The North American version of the European species Lactarius chrysorrheus is mycorrhizal with oaks from the Great Plains eastward; it features a pale pinkish cap, gills that do not develop reddish spots and discolorations, and white milk that turns yellow when exposed to air. Its stem is not slimy, and its surface does not feature potholes. The smooth stem is a good way to separate Lactarius chrysorrheus from Lactarius maculatipes, which shares the preference for oaks and the yellowing milk but features yellowish potholes on the stem surface (and a nearly white cap). The similar Lactarius vinaceorufescens is mycorrhizal with conifers, usually has a redder cap, and has gills that develop reddish spots by maturity. 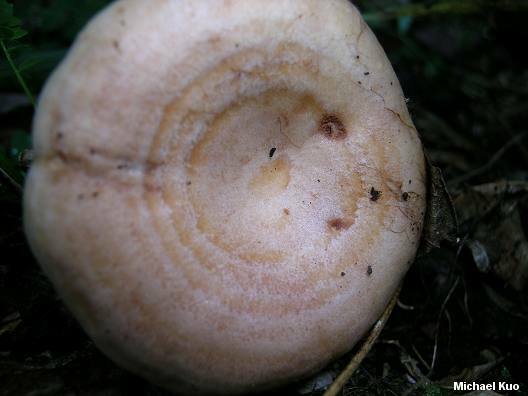 If you are on the West Coast, see Lactarius xanthogalactus for the closest look-alike to Lactarius chrysorrheus. 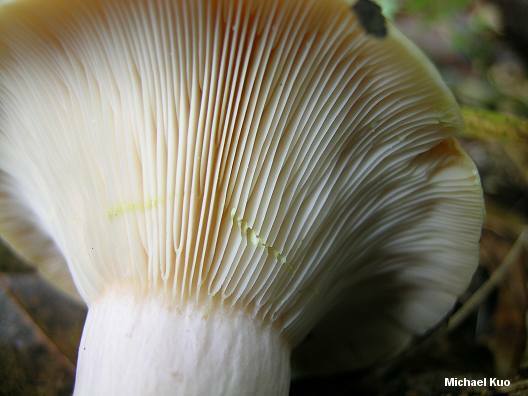 "Lactarius chrysorheus" (with one r) is a spelling used by some authors. Ecology: Mycorrhizal with oaks and possibly other hardwoods; summer and fall; probably to be expected throughout the oak forests of eastern North America. Cap: 3-10 cm; broadly convex with an inrolled margin when young; becoming shallowly depressed or vase-shaped with an uplifted margin; moist or dry; smooth or finely roughened; pale pinkish to pale cinnamon; often with vague concentric zones of color, at least when young. Gills: Attached to the stem or beginning to run down it; close; whitish to pale yellowish; not bruising or discoloring, not developing reddish spots with maturity. Stem: 3-8 cm long; 1-2 cm thick; more or less equal; dry; without potholes; whitish. Flesh: White; firm; yellow when sliced. Milk: Copious; white, becoming quickly yellow on exposure to air. Chemical Reactions: KOH on cap surface yellowish to pale olive. 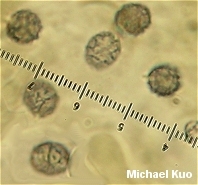 Microscopic Features: Spores 6-9 x 5.5-6.5 µ; broadly ellipsoid; ornamentation 0.5-1.0 µ high, as amyloid warts and ridges that form partial reticula. 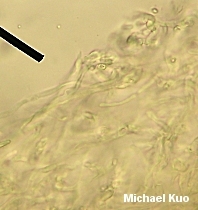 Pleuromacrocystidia to about 75 µ long; fusiform. 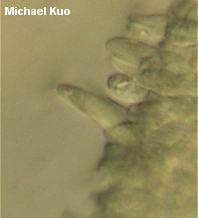 Cheilomacrocystidia similar. Pileipellis an ixocutis. REFERENCES: Fries, 1838. (Saccardo, 1887; Coker, 1918; Kauffman, 1918; Hesler & Smith, 1979; Smith, Smith & Weber, 1979; Weber & Smith, 1985; Phillips, 1991/2005; Heilmann-Clausen et al., 1998; Metzler & Metzler, 1992; Barron, 1999; McNeil, 2006; Miller & Miller, 2006; Binion et al., 2008.) Herb. Kuo 10010408.